The township of Erhards Grove (township 135, range 43) was organ ized on September 24, 1870. The petition for the organization of this county was dated July 2, 1870, and of the sixteen names attached to the petition, every one with possibly one or two exceptions are Scandinavian and nearly impossible to decipher. The only names which could be read are the following: C. A. Evans, C. D. Reck, Petre Daves, Wiljam Daves, Cristof son Anderson, Ole Olson, Alexander E. Erhard and Petter Knobel. The first election was held at the house of A. E. Erhard. This was the thirteenth township organized in the county. It is bounded on the north by Pelican, on the west by Trondhjem, on the south by Eliza beth and on the east by Maplewood. There are a great number of lakes in this section, but they are all small and very few of them have outlets. 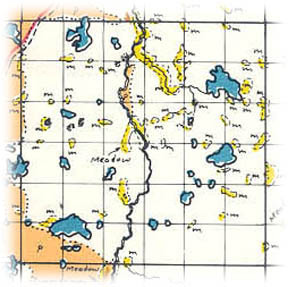 Sand berg lake is the largest and Lake Knobel is second, with thirty-two minor lakes. The farms in this township are as a rule, small, the largest percent age containing twenty or forty acres, although the northern side they are somewhat larger. The Pelican river meanders southwest through the cen tral part of the township. This furnishes an excellent natural and artificial drainage for the farms in this township. This river is the outlet for the various lakes in the northern and eastern part of the township. The Great Northern Railway runs the length of the township from north to south. This road was built in 1881-82 and furnishes an outlet to the seat of justice for the farmers of this section. There is only one station on the line in Erhards Grove township. The present township officers are as follow: Supervisors, Edward Bruestle; chairman, Nils Skalstad and John Kowalski; clerk, P. M. Knoff; treasurer, A. O. Solum; assessor, Christ Kittelson; justice, J. S. Sammons; constable, M. E. Lee. The village of Erhard, in the township of Erhards Grove, is located in section 28, township 135, range 43. It was platted by L. R. Lothrop for Sven and Elisabeth Syverson and recorded in the office of the register of deeds July 25, 1882. Places of birth for Erhards Grove Township in the 1905 state census.